Also known as oil beetle or thick-legged flower beetle. The adults are pollinators of umbeliferers. The grubs each dead stems. Becoming more common in our garden. Looks a bit like a wasp, moves like a wasp, but that's where the similarity ends. 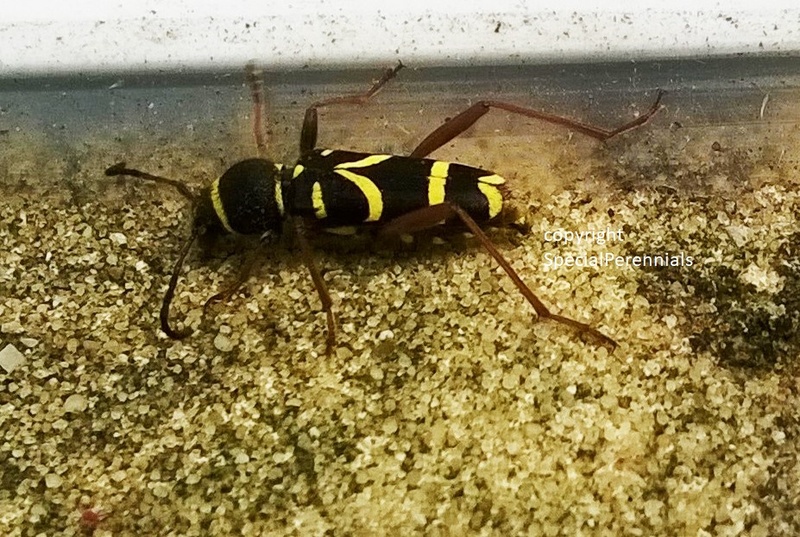 This beetle has no sting and mimics a wasp to deter preditors. Not a pest. Fairly common in summer. This mean looking beastie is a Rhinoceros Beetle and you can see why its called that straight away. Its larva feed on rotting wood and the adults do feed on tree sap but are in such small numbers as not to pose a threat. It is widely spread across the UK but not in great numbers. Sep: Lots of these in our garden this week but you have to be patient to spot them. Sep: spotted this mean look bug on a Helenium today. It is, I think, a Black Slip Wasp (Pimpla instigator) and is a parasitic wasp laying its eggs into the larvae of other insects providing its hatching young with an instant food source. It makes "Alien" seem a bit tame don't you think? Aug: Janet found this handsome, iridescent, black beetle under a pot today. Its a Dor Beetle (Geotrupes stercorarius) and is fairly common in pasture land where it digs a nest and lines it with dung for its larvae to feed on. It is harmless to plants. Real life size is about 1.5cm long. They fly but are said to be a bit clumsy, often crash landing. Aug: I don't often look at flies closely but aren't they interesting in close up? This is Mesembrina meridiana, common name Noon Fly spotted on our Bronze Fennel. Sep: Flies get largely ignored in the garden but its difficult not to notice this little jewel, the Green Bottle Fly (Lucilia sericata). Aug: Its scientific name is Araneus diadematus from which its common name the Diadem Spider comes - see the white cross on its abdomen? This is the original Daddy Long-Legs in our garden, although the Crane Fly seems to have taken the name more recently. This is a Harvestman. It is named for the harvest as it is more commonly seen in August and September with fewer in other months. There are 25 species in the UK. It is not a true spider, it doesn't spin any silk and doesn't have venom to kill its prey. They eat all manner of small bugs, mites, slugs, aphids. Apparently when threatened they secrete a foul smelling fluid to protect themselves. September: I'm finding a lot of these juvenile shield bugs around at the moment. They don't do any harm as far as I know. Aug: This is Janet being very brave and playing host to a Red-Legged Shieldbug (Pentatoma rufipes) which is thankfully harmless. Fairly common in gardens from July into the autumn. Ladybird larvae are voracious eaters of greenfly and this one is just about to get his (or her) dinner on a Knautia macedonica plant in our garden. You may spot these little orange and black bumps on leaves of herbaceous plants in the garden right now. Don't squash them!They are the pupating larvae of Ladybirds. "Help Wanted - lunch provided." Actually this ladybird polished off the blackfly on this Cardoon stem single-handed in no time at all. Just recently lots of these Soldier Beetles have arrived in our garden. They are less 1cm long and fly or walk from flower to flower. There is no reason for alarm as they are carnivorous and feed on bugs, flies and caterpillars. I suppose they do some useful pest control but also suspect that they also eat some beneficial insects as well. Their larvae are soil dwelling and eat small slugs and bugs.